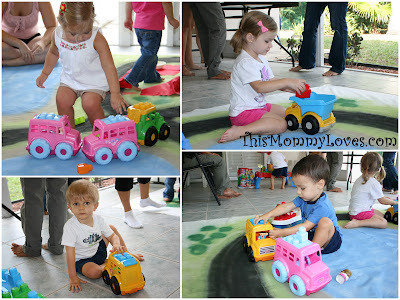 Tweet Our playgroup kiddos range in age from 22-27 months and the last few times we've had a playdate, it usually ends up being utter chaos with little organization and a slew of toys thrown everywhere. 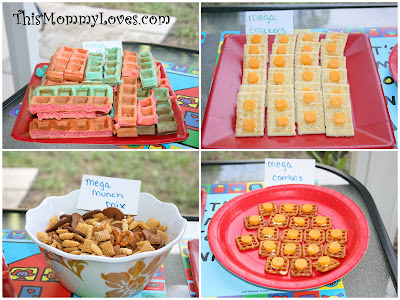 I wanted to try and create a more structured playdate centered around just a few toys or stations so when I was recently given the opportunity to host a playdate sponsored by MegaBloks, I jumped at the chance. 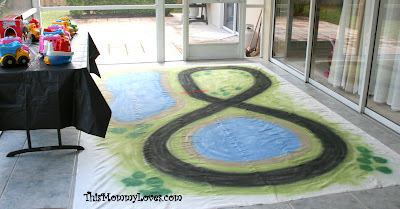 The Handy Husband helped to create this awesome Racetrack Mat (click for tutorial) using a painters' tarp ($7.00 from Home Depot) and spray paint. The kids enjoyed racing their MegaBlok Trucks , Buses , and Ships on the tarp and at the end of the party it just folds up to be used another day. Station 1: Dump Trucks , Buses , Boats , and Tractors on the racing mat. 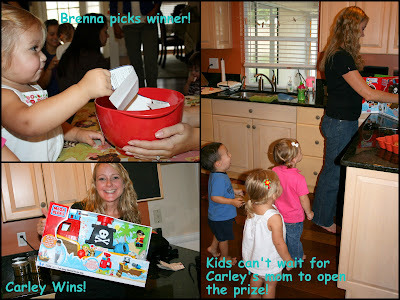 The Raffle: We were given a MegaBloks Pull Along Musical Pirate Ship to giveaway as a raffle prize. All together this was a really fun playdate. 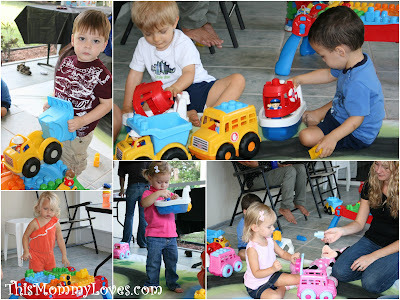 The boys especially loved the trucks and ships and played well on the racing mat. 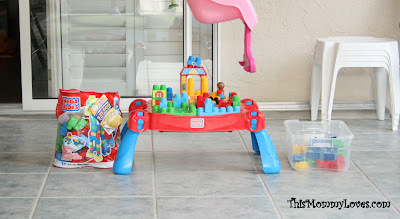 They all took turns rotating from the Play 'n' Go Table to the Racetrack Mat and all together the toys held their attention for close to an hour. I found the Megabloks big enough so that they had no trouble manipulating them on their own and with help from the adults they had fun building towers and castles. 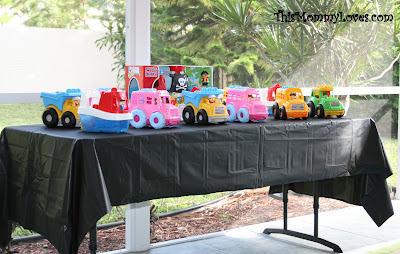 Disclosure: BSM Media, MommyParties & MegaBloks supplied a party kit which included all toys for the playdate and the raffle prize. What a great idea! And I love how your husband also lends a helping hand! Looks like the kids loved the party! Oh my goodness... My sister made an incredible roadway quilt for her son to play trucks on, but the tarp your husband made looks just as good and probably took much less time! What a GREAT idea! What an ADORABLE idea Jenn!